The canal's role as a place for pleasure jaunts continues to this day, with a number of partners involved in turning portions of the canal into recreational paths. Warren County has been an active partner by promoting a greenway corridor and preserving the historic remains of the Canal as an important part of the County's transportation history. The vision is to have this greenway extend across Warren County with the canal as a link to recreational, cultural, and historic areas including state parks and trails, plus municipal and county public open space. This greenway will extend between canal sites in Phillipsburg and the historic Waterloo Village ­ a restored canal town. 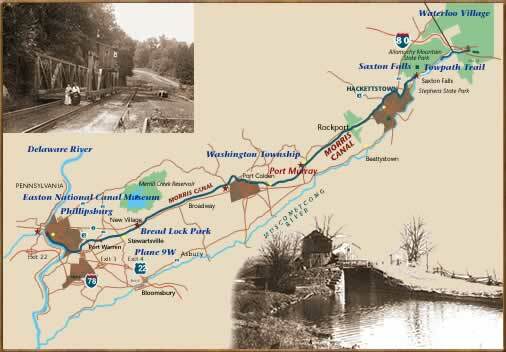 The canal travels through the scenic Musconetcong, Pohatcong and Lopatcong valleys for thirty-three miles from Phillipsburg, on the west, to the county line near Waterloo on the east. This heritage corridor gives reminders of its glory days; inland ports of call with names like Port Colden, Port Murray, Port Warren, Port Washington, Rock- port and descriptive identities, such as Fresh Bread Lock, Guinea Hollow, and Greene's Bridge. The Morris Canal was the brainchild of Morristown businessman George Macculloch, who envisioned a commerce route that could surmount North Jersey's rugged terrain to ship coal, iron ore, farm produce and other products across the state. To conquer an unprecedented 1,674-foot change in elevation - 760 feet from the Delaware River at Phillipsburg up to Lake Hopatcong, the summit level, and 914 feet back down to tidewater at Newark Bay - the Morris Canal used a series of locks and a new innovation, the inclined plane. Operated from 1831 to 1924, the Morris Canal was considered an engineering marvel of its time, but, by the end of its life, it had been surpassed by railroads as a shipping route. Although employed on a smaller scale on English canals, the inclined plane was adapted for the Morris Canal and used to conquer changes of elevation anywhere from 35 feet to 100 feet. The canal boats were floated onto a cradle car, which was pulled out of the water, then up or down on iron rails to the next section of canal. Those iron rails were supported by heavy stone sleepers, which on several of the planes can still be seen, often with a groove worn into them by the thick cable that raised and lowered the cradle car. sThe route contained 23 lift locks and 23 inclined planes; 7 of each were in Warren County. Plane 9 West: One of the sites most often visited along the Morris Canal is Plane #9, home of James Lee Sr., noted Canal historian and author of "The Morris Canal" and "Tales The Boatmen Told". This plane had an elevation change of 100 feet, the longest on the canal. Bread Lock Park: The County Historic Learning Center at the site of Lock 7 West contains the remains of the prism, a former mule barn and lock tender's house sites. Visitors can view working scale models of an inclined plane and lock, along with other models related to local history. The Center is open 1-4 pm on the first Sunday of each month. Waterloo Village: The restored historic canal town features waterwheels, blacksmithing, historic house tours, period craft shops, Canal Museum and special weekend events. Admission Fee. To view sections of the canal, the visitor would do well to bring along Macasek's book, which was published by the Morris County Heritage Commission. Detrick also suggests bringing a copy of James Lee's photographic history, as many of the structures in the vintage photos are still apparent today. Meanwhile, Detrick says a 1987 study by Morrell, Historic Preservation Survey of the Morris Canal in Warren County, New Jersey, is another useful resource for people who want to explore remains of the canal from Phillipsburg to Allamuchy on the Sussex County border. The survey is available from the Warren County Planning Department (908-475-6532) at a cost of $30.